During the 1980’s, The Sunshine State of Florida was ground zero for a revolutionary metamorphosis in heavy metal that would result in the birth of an altogether new genre: Death Metal. Whether the stewing, oppressive humidity of the state, the unusually over-abundant droves of elderly retirees creeping about its roadways, or perhaps the accessibility of many illicit drugs as a national port of entry influenced that, who knows? What is known is the documented history of bands like Mantas (pre-Death), Morbid Angel, Executioner (pre-Obituary), Massacre, Oblivion (pre-Atheist), Cynic, and others originated in Florida at that time. One of those others was Tampa’s NOCTURNUS, the band formed in 1987, by drummer and vocalist (and Morbid Angel co-founder) Mike Browning, after the breakup of his earlier band, Incubus. Alongside him at that start was another ex-Incubus member, guitarist Gino Marino, and former Agent Steel bassist Richard Bateman. The band began working on material and soon after the addition of second guitarist Vincent Crowley to the band, they recorded and released a four-song, self-titled demo. Even then, the music of NOCTURNUS set itself apart from many of the band’s equals by containing thrash and traditional metal elements, while those peers seemed to be shooting for brutal heaviness in general. Before long, Vincent Crowley exited the band (going on to form Acheron) and a cousin of Gino Marino’s, 18-year-old guitar prodigy in the making Mike Davis, joined in the vacated slot. This change was followed by Bateman’s departure to join another rising Floridian act, Nasty Savage, and in his stead, enter bassist Jeff Estes and a keyboard player, Louis Panzer, in 1988. This would be a pivotal moment in the existence of NOCTURNUS, as having a keyboardist in a death metal band was an utterly foreign concept. Yet, in this case it was a brilliant move that would deliver rewards the band could not imagine. With a new line up in place, NOCTURNUS would again record and release another four-song demo in 1988, ‘The Science Of Horror‘. Of course, they were still a raw, aggressive band, not quite yet the one that would in time be hailed as an innovative game-changer. That would require further changes in the NOCTURNUS roster, at least one in particular, and in 1989, Gino Marino left and was replaced by guitarist Sean McNenney. With McNenney’s arrival came a masterfully technical player equal to the caliber of the youthful Davis. Together the pairing truly were one of extreme metal’s greatest guitar duos in the minds of many. During NOCTURNUS‘ live performances, the pair’s onstage guitar duels, trade-offs, and attempts to outdo one another became a main focal point. Factor in the band’s unique, multifaceted music delivered via technically minded, talented, and perfection-pursuing musicians, and you have a recipe for greatness. The word was out about NOCTURNUS and spreading like wildfire, eventually getting to Earache Records with some help from friend of the band, Trey Azagthoth (Morbid Angel). The U.K. based label signed the band in 1989, and from there they went right to work on their début album with producer Tom Morris (Crimson Glory, Iced Earth, Coroner, Ludichrist). In late summer 1990, Earache Records issued the album that resulted – the now monumental, landmark 10-song masterpiece that is ‘The Key‘. This truly was a stand alone recording, with its conceptualized occult-meets-science-fiction themes, seemingly inhuman guitar engagements, and of course the coup de grâce of its contents, those out-of-this-world, space age keyboards. ‘The Key‘ almost instantly became a death metal hit, spawning classic tracks like “Standing In Blood“, “BC/AD (Before Christ/After Death)”, and the track that received the official video treatment, “Lake Of Fire“. Though it would not be publicly revealed at that point, it has since come out that bassist Jeff Estes had developed a terrible drinking problem during the recording of the album. It was reported and widely believed that Mike Davis handled bass duties during the recording sessions, yet either way, Estes was fired soon after ‘The Key‘ was released. NOCTURNUS recruited bassist Jim O’Sullivan and embarked upon a tour to support the album with Bolt Thrower, followed by their inclusion on the Earache assembled Grindcrusher Tour in the U.K.. The highly popular 1991 tour also included Morbid Angel, Napalm Death, and Godflesh, yet O’Sullivan was not working out well, either, and when the tour was over, the band let him go. 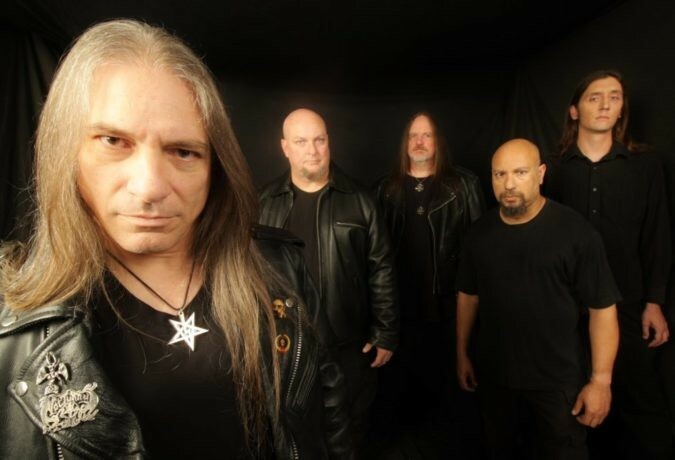 More changes would be in store for NOCTURNUS, beginning with the decision to bring in a full-time lead vocalist at the behest of Earache Records (Browning had handled drumming and vocals). Former Tortured Soul vocalist Dan Izzo was brought in to front the band, while session bassist Chris Anderson was hired to play on recordings for a new album. The album that would manifest was ‘Thresholds‘, again produced by Tom Morris, released in late 1992, where it immediately revealed distinct alterations in areas that displeased many fans of the band. Whether it was less involvement from Mike Browning in the songwriting, the album’s more polished sound, Izzo’s heavier vocal styling, or what, ‘Thresholds‘ did not commercially sell well. This was despite its favorable reception by critics for its ambitious, unique progressive direction that relied more on melodic elements, while broadening the scope of the music itself. Utilizing things like acoustic guitars (“Arctic Crypt“), exotic percussion (“Tribal Voudon“), and a solely instrumental track (“Nocturne In Bm“), the sophomore release seemed to reveal a maturing musical approach from NOCTURNUS. The band brought in a new, permanent, bassist around this time, Emo Mowery (formerly of Malediction), as well as embarked on a European tour to support ‘Thresholds‘. During it, the band grew unsatisfied with Earache’s lack of promotion that ultimately led to a lack of any real financial gain from the trek. This would soon become the least of their worries, though. Upon returning home, musical differences between Mike Browning and the rest of the band were becoming apparent, leading to increasing internal strife. The culmination of this was Sean McNenney and Louis Panzer (purportedly behind Browning’s back) legally ensuring rights to the “NOCTURNUS” name. They did include Mike Davis in those rights, but not Izzo or Mowery, and once locked in, they fired Mike Browning from the very band he had founded. It would prove to be their undoing though, as this 3.0 version of NOCTURNUS attempted to carry on and began writing songs for a planned third album. Earache Records continued to offer less and less of their support to the band, eventually dropping NOCTURNUS, who had several songs written with their latest line up. 1993 would see a two-song, self-titled EP from the line-up of Dan Izzo, Mike Davis, Sean McNenny, Emo Mowery, and new drummer, James Marcinek, released through Moribund Records. It fell short of any real movement for the band, driving Panzer, McNenney, and Marcinek to all leave NOCTURNUS, bringing an end to the band… or did it?! Sometime around 1998, Sean McNenney and Louis Panzer began playing together again and writing new music. The pair eventually felt the ideas and the music they were coming up with could work as new NOCTURNUS material, leading to Mike Davis and Emo Mowery then getting involved. The quartet brought in a new drummer, Rick Bizarro and, in another new approach, decided Mowery would handle lead vocals along with playing bass. Working with producer Greg Marchak, this version of the iconic band recorded a “comeback” album, their third official full-length offering, ‘Ethereal Tomb“, released in late 1999, through Season Of Mist. To the fans of NOCTURNUS, this latest record was very decidedly unlike either of its predecessors as ‘Ethereal Tomb‘ contained refined music with increased ambient aspects, and less prevalent keyboards. However, this incarnation of the band was to be short-lived too, disbanded by 2002. This would effectively be the demise of NOCTURNUS once again… or would it? Since that dissolution, two compilation releases of earlier NOCTURNUS demos were issued: Karmageddon Media’s 2004 offering of pre-Earache Records material, ‘The Nocturnus Demos‘, and Nuclear War Now! Productions’ 2014 item, ‘The Science Of Horror‘. Both followed an independent 2004 DVD home video release, ‘A Farewell To Planet Earth’ that amassed three separate fan-filmed live shows into one collection. In the years since their first rise in activity and significant releases, the legend of NOCTURNUS has grown without restraint. Unquestionably, reverence for the band continues, partly bolstered by the widely recognized reality of ‘The Key‘ as one of the most important death metal albums of all time. Not just death metal either, as the album has influenced a huge cross-section of players from differing styles and sub-genres that include symphonic metal, progressive, ambient, psychedelic, and technical metal. In 1999, original NOCTURNUS band founder Mike Browning, along with fellow original members Richard Bateman and Gino Marino, assembled a new band with guitarist Mike Walkowski named After Death. On an exclusive European tour, they played live songs from a combination of music from Browning’s earliest bands and album contributions, ‘The Key‘-only material from NOCTURNUS and ‘Abominations Of Desolation‘-only music from Morbid Angel. Since 2002, they’ve issued at least five demos, one 2007 compilation titled ‘Retronomicon‘ that compiled them all together, and a split in 2012. After Death has gone through membership changes, while playing interesting shows like the 2008 tour of the U.K. and Europe, where the band played using the NOCTURNUS name. They also did this on a tour of Mexico in 2013, followed by an announcement that the band would play the 2014 Maryland Deathfest, performing ‘The Key’ album in its entirety as NOCTURNUS A.D. If you have stuck with the twists and turns of this iconic band’s tale so far, I commend you, for you are a true fan and should really appreciate what’s coming next. This week, NOCTURNUS A.D. broke the news that untold armies of metalhead warriors and fans have anxiously awaited to receive, and may have questioned ever arriving. Resurrected from the ashes of one of the more influential death metal bands, extreme metal mastermind Mike Browning will continue the tale that began 28 years ago with ‘The Key‘! On May 24th, Profound Lore Records will release the long-anticipated début album ‘Paradox‘ from NOCTURNUS A.D.. The album is the direct musical and thematic follow-up to 1990’s ‘The Key‘, one that picks up the occult-enhanced science fiction tale of Dr. Allen William Magus (aka Dr. Magus). The diseased scientist ravaged by a war-borne plague, only kept alive by the creation of a bio suit; the aftermath of the events originally revealed on ‘The Key’. Joined by his After Death band mates – guitarist Demian Heftel, bassist Daniel Tucker (ex-Obituary), guitarist Belial Koblak, and keyboardist Josh Holdren – Mike Browning once again orchestrates a foreboding tale of lethal sci-fi set to intricately technical death metal, enhanced with atmospheric textures across a thought-provoking spectrum of dynamic heaviness. All of ‘The Key‘ ingredients are here, from the incinerating blaze of molten guitar work, to the cosmos-harnessing keyboards and of course, the dual duty of inspired drumming and the essential, revived Browning vocalizations. ‘Paradox‘ was produced by Jarrett Pritchard (Goatwhore, 1349, Gruesome, Wolvhammer) at New Constellation Studios and features artwork by Timbul Cahyono (Pyrexia, Avulsed, Terrorizer). With the unveiling of the artwork and track list today, comes the first single to be shared, “Precession Of The Equinoxes“. The album will be issued on CD, LP, Cassette, and Digital formats with pre-order active now at this LINK.